Unexpected? The pairing of viola da gamba and accordion is certainly that! But perhaps even more surprising is how well the singing strings of the veteran instrument harmonize with the subtlyvibrating reeds of the centuries-younger newcomer. Also unexpected is this cross-generational meeting of two musicians (what are the odds? ), who found each other exploring the 'poetical humours' of earlyseventeenth-century England. 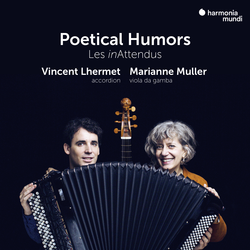 Recently reunited in the recording studio after several seasons of rapturously received recitals, with this well-timed album the duo Les inAttendus makes its first entry into the harmonia mundi catalogue.